With more and more websites demanding our attention everyday, it’s getting harder and harder to keep track of all our passwords, never mind our logins for each site! Luckily, there happens to be a little tool to help keep track of not only website passwords, but also software licenses and email information, called 1Password. 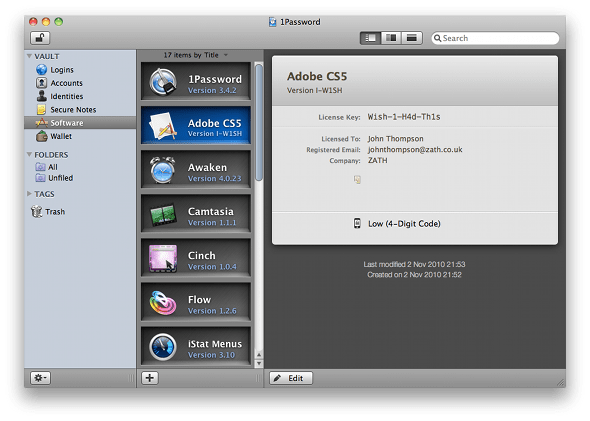 Originally, 1Password was only available for Mac OS X, but the developers have since released version of the popular application for Windows and the iPhone too. 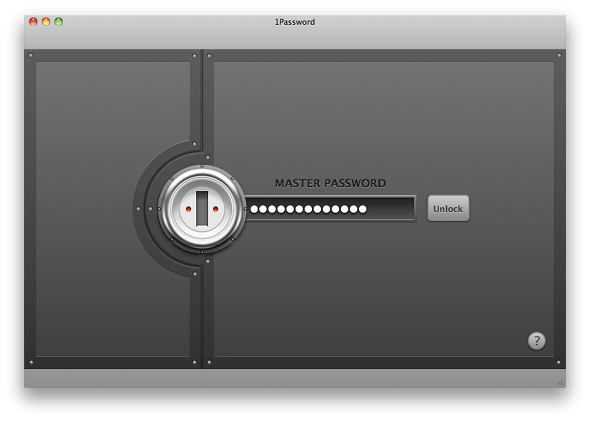 The interface of 1Password on Mac OS X is simple, yet extremely functional with a bit of eye candy thrown in for good measure. When you open the application, you’ll need to type in your master password to login, and access all of your data within the program. After clicking the “unlock” button, presuming you have typed in the right password, the doors to your virtual vault of goodies will slide open for you, with the help of a rather satisfying sound effect. Eye and sound candy aside, I mentioned earlier that the interface was extremely functional, and you can immediately see why. You can choose between three alterations of the interface, although it remains extremely similar whatever option you choose. The window is split into three panes, with the far left hand pane of the window housing all your group shortcuts. These include your internet logins, software licenses, and your virtual wallet, too! Once you’ve selected the category that you need information on, the second pane splits this in to all of the passwords or licenses that you have stored. This is where 1Password really starts to work its magic; to have all of my software licenses in one place is absolutely crucial for me, as I have a lot of software that I have purchased over the years for my MacBook Pro. Whether I have uninstalled a program and wish to use it again a few months down the line, or wiped my machine and need to re-install every application I own, having your licenses in one place is the perfect way to be productive and make sure everything is installed quickly. A number of OS X applications require a small password file to unlock full functionality, but you’re fully covered here as well, as you can attach files to records and make sure you’re ultra organised! It’s sometimes easy to forget that the primary aim of 1Password is to keep all of your internet logins and passwords together, as it does it with such ease without you even knowing that it’s there. There is an extension which is made for Safari on Mac that places a 1Password button in the browser, and allows you to just press it and have your details filled in, be it your personal details or login information. There is also a Chrome extension which is available, but it’s a little trickier to implement. Hopefully, the 1Password team will make this process as simple as it is for Safari, as Chrome is my main browser on all of Mac computers at the moment! It’s difficult to summarise such a positive review without making it sound like a sales pitch, but you really can’t look much further than 1Password if you want an all in one application to take care of all the internet passwords you have, alongside serials and other license information for software. You can purchase the Mac OS X for approximately £25, or choose the brand new Windows version for approximately £12.50 whilst it’s still in Beta.